Ready for some fun? Spring is finally here; you’ve been cooped up all winter with snow, cold, and lots of rain. Time to get outside, breathe some fresh air, and play. Playing is good for any age, and Raymond Baldorossi, Jr, CEO of Softgolf™, has just the answer—come play a round or two of Softgolf™ with your family and friends. You may be wondering, “What is Softgolf™?” Glad you asked . 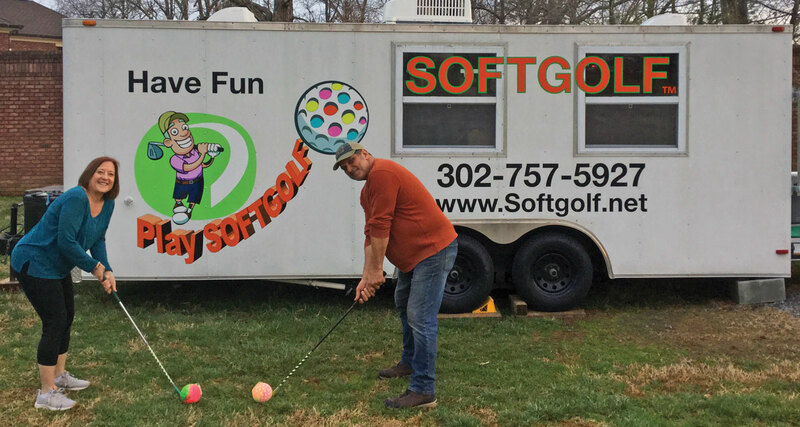 . .
Softgolf™ is a full-swing golf game played on a nine-hole course using a four-inch foam ball and three large-faced clubs (a 3-iron, an 8-iron, and a putter). Clubs are available for right or left-handed play and are sized for players six years of age and up. The game utilizes the same fundamental skills as conventional golf, yet the ball flies about 70 yards on a good hit and is more forgiving than golf when it is mis-hit. A laser-light show and upbeat music at every tee-off area add to the fun. Ray shared that his Mom still plays at 91 years young. “She gets to play for free, and all mothers will play for free on Mother’s Day!” The game is designed for all ages, skill levels, and physical abilities. The grounds are relatively flat, which makes walking the course easy. In the future, Ray does plan to add specialized golf carts, which will give paraplegics the ability to enjoy the game, too. There’s a 10th hole that is being used to help raise money for the Softgolf™ chapter of “Stand Up and Play,” via a 50/50 “Hole in One” contest. The Softgolf™ course opened at Tanglewood Park on March 15, with hours from 10 am to 10 pm daily (weather permitting). Playing at night is especially fun, since the balls, the clubs, holes, flags, and scorecard stands illuminate in the dark. Besides the fun factor, Softgolf™ is a green-energy business. The course is relatively dark and all the equipment is entirely solar-powered, so players may enjoy playing in a fun, colorful ambiance that is environmentally friendly. An all-round win-win for players and the environment. Softgolf™ is ideally suited for events. Make reservations (302.757.5927) for corporate team-building events, family or class reunions, birthday parties for any age, or any celebration you can think up. Since Softgolf™ is designed for anyone to play in a fun, stress-free environment, folks who haven’t played before can play alongside highly skilled players. Softgolf™ has been part of Ray’s family for many years. His parents, Blanche and Ray, Sr., patented Softgolf™ in the mid-70s and operated a course through 1988 in Delran, New Jersey. They held numerous patents on their designs for the game. Ray has four patents pending for enhancements he’s developed for the Softgolf™ game. A true Renaissance man, Ray is always looking for ways to better the game for players, such as the recently reinvented scorecard stand. In addition to developing this sport, Ray is a former professional Jai-Alai player, a published poet, and a songwriter/musician/singer. 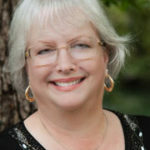 His partner, Carolyn Bennet Sullivan, is the VP at Softgolf™ and also a published author and inspirational speaker. Visit their website (www.Softgolf.net) to learn more about this fun activity and make plans to play Softgolf™ often. By making reservations on their website (www.Softgolf.net), you can guarantee your tee time. Plus, the online per person cost is $10 ($9.37 plus tax), versus $12 ($11.24 plus tax) for those without reservations. Softgolf™ is located next to Tanglewood’s dog park where there’s no entry fee and the parking is free. Come out and play Softgolf™! Enjoy the fun and fellowship of the game and the beauty of nature. As Ray shared, “I want people to experience togetherness, get active, and get away from high tech devices. Enjoy real life, build memories, and have fun with friends and family.” It’s game time!! Qualifying tournaments for the World Softgolf Championship will be held at the Tanglewood Park course beginning in May! Top scorers from the qualifying events will be invited to participate in the Championship event in late September. Be sure to check the website (www.Softgolf.net) for more details. Join the fun!